Are you a fan of the "tiny homes" trend? Turn on a cable channel like HGTV, and you're sure to run across a show dedicated to this interesting movement, mostly inspired by those advocating a sustainable, minimalist lifestyle. And while we wouldn't necessarily recommend trying to cram your family of four (and perhaps a few fur babies) into 300 square feet, you may be thinking about selling your home and moving into a smaller place, or maybe you're considering moving your family into military housing that's smaller than you've been used to in the past. How can you know if downsizing will work for you? Start with a few key questions. 1) Do you have more upkeep than time? The huge lawn that was such a selling point when you first bought your home has now started to eat up all your free time, and the housekeeping and cleaning chores that seem more trouble than they're worth at this point in your life may mean it's time for a change. 2) Are house payments and other expenses making the rest of your budget tight? Maybe the fixer-upper seemed like a great idea a few years ago, but you find the to-do list (and accompanying bills) never ending. If your repair bills, mortgage, and utilities cause stress to the rest of your finances, it might be time to make the change to a smaller home with less work and lower payments. 3) Do you have rooms sitting empty? Are you still saving rooms for now grown children? If you walk into a room and can't remember the last time you actually used it, it might be time for a more compact space. 4) Have you recently experienced a lifestyle change? If you recently retired from the military or experienced another big life change and now spend more time on activities away from home, moving to a smaller place can free up your finances to suit your new lifestyle! 5) Do you hope to live in a more expensive area? Perhaps you'd like to live near a golf course or relocate from an area with freezing winters to a home in the warmer South, complete with pool. It might make sense to have more expendable income by choosing to live in a smaller home in an area with the amenities you desire! 6) If you decide to downsize, are you able to let go of some belongings? When considering downsizing to a smaller home, it's time to be realistic about also downsizing belongings. If you're not willing to either purge some of what you own or at least put some things into storage, you definitely won't be a candidate for Tiny House Hunters! While making the decision to downsize is not an easy one, if you do decide to go that route, MilitaryByOwner has plenty of help for living in your new small space! And remember, you can easily search for homes by square footage large or small with the advanced search filters on MilitaryByOwner. 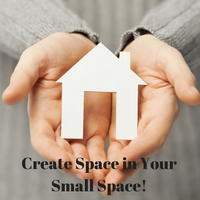 You might also like these posts, specifically written for the downsizing crowd!